Busan is South Korea's second largest city and despite it being only 450 km from Seoul, it couldn't be more different than the nation's capital. My mom and I decided to take a trip down south back in May during Buddha's Birthday, a national holiday here in Korea. We hopped the incredibly comfortable and efficient KTX bullet train at Seoul Station and were in Busan in about three hours. We were glad we had booked our tickets a month in advance, which is necessary to do when traveling during a holiday weekend, because there were a lot of people that were forced to stand in the aisles for the entirety of the trip. Although transportation wasn't a problem, we had waited too long to book hotels and I ended up having to reserve a room at Hotel Yaja, a love motel, as everywhere else was booked. I was hesitant to tell my mom where we would be staying, as I knew she probably wouldn't be able to figure it out on her own even after we were there. I ended up telling her anyway and as I had expected, she was quite skeptical... nervous even. But, the thing about love motels in Korea is that most of them are incredibly nice and clean, despite their sketchy reputations. Sure, they can be rented by the hour, but many people on a budget stay in these facilities when traveling. When we arrived at our room, my mom was quickly impressed with the chic design and modern amenities: two computers, a huge flat screen TV, a jacuzzi tub, and an infinite number of cosmetics and toiletries available for use free of charge. Soft drinks and egg McMuffins were also delivered to our room each morning. By the end of the trip, Mom was totally down with love motels. We started our three day, two night trip by heading to the famous Gukje Market. Wandering the narrow alleys of the busy market, avoiding the agressive ajummas eager to find sales, we saw a number of wares from stationary to cooking utensils to kimchi. Gukje is similar to Namdaemun Market in Seoul, but something felt entirely different about it. Maybe it was the heat or the ocean air, but the hustle and bustle was actually rejuvenating rather than frustrating. Although we didn't make any purchases, it was fun to have a look around before walking to the nearby Jalgalchi Market, Korea's biggest fish market. The assortment of seafood was incredible and Mom was introduced to the bizarre species never seen on our side of the world. 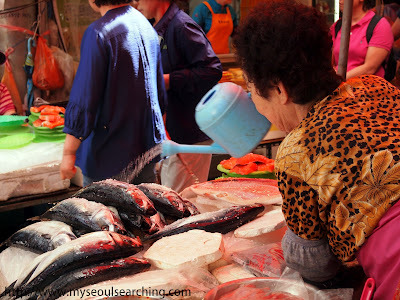 We were both impressed with how the vendors (mostly women) handled the fish... their slicing and dicing and scaling and cleaning seemed to be more of an art than an occupation. Not able to stomach the smell, Mom suggested we move on. The variety of fish was endless at the Jalgalchi Market. 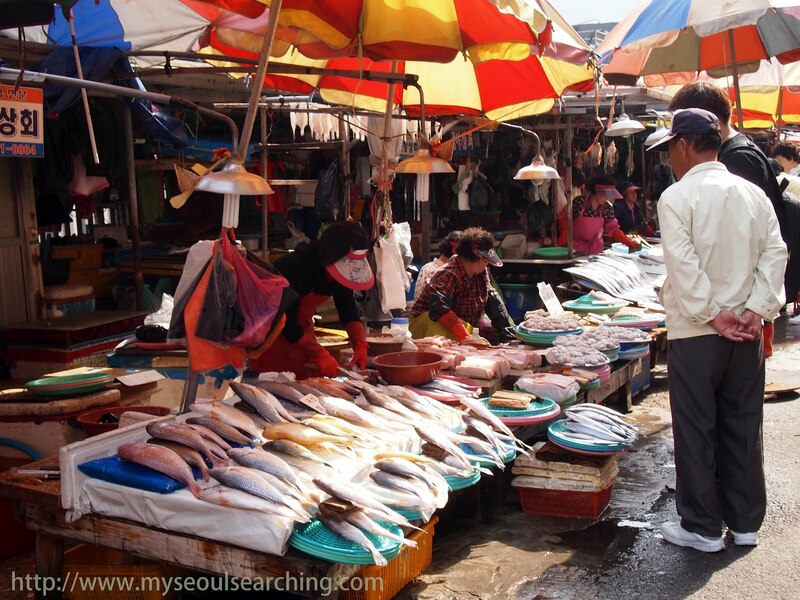 Skilled vendors at the fish market are just as much an attraction as the seafood. 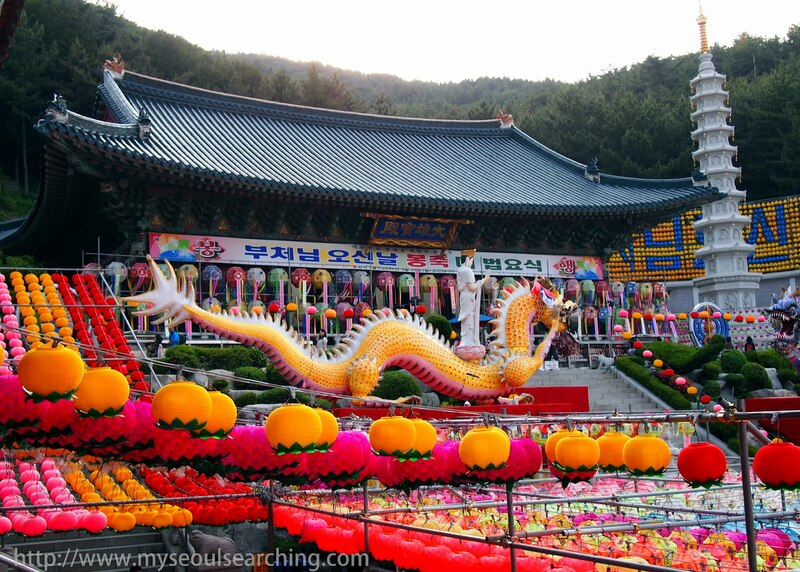 I had read that Samgwangsa Temple was not to be missed during Buddha's Birthday, so we hailed a cab to the temple, built into the side of Baekyang Mountain. It didn't take us long to realize why it was a must-see attraction. 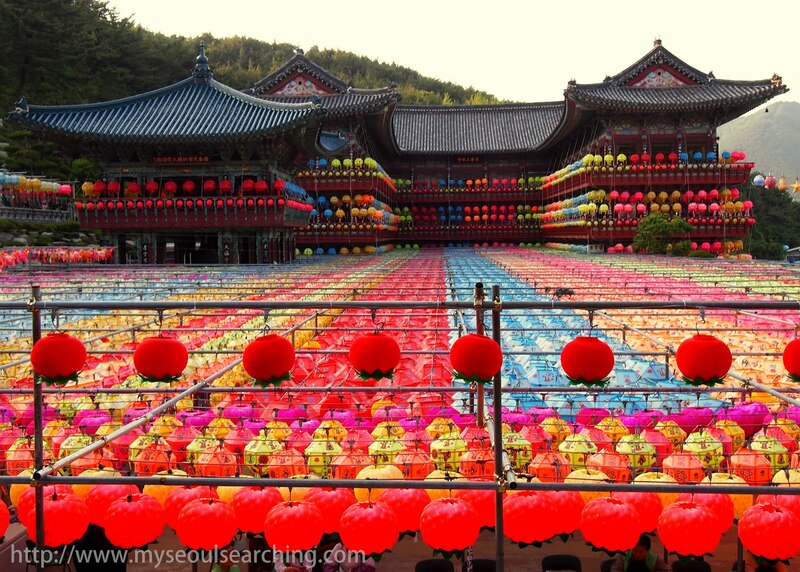 The entire complex was blanketed with lanterns of every size and color. Now, I have seen a number of temples all over Asia over the past few years, but no structure was as colorful and joyous as what we were seeing. There were a number of locals purchasing 10,000 won tags to write their names to hang from one of the thousands of lanterns for good luck (and trying to convince us to do the same) while others were prostrating themselves in prayer. In addition to the lanterns, the 9 story pagoda built for the reunification of the Koreas was also inspiring, as were the animal guards nearby, representing each year of the Chinese zodiac. Samgwangsa during Buddha's Birthday was breathtaking. I can only imagine what it looks like at night. 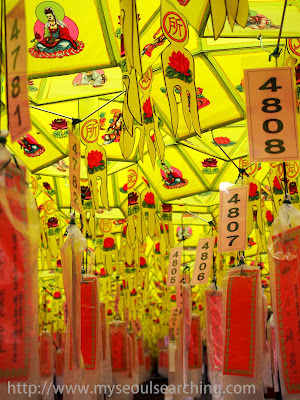 These tags hanging from the temple's lanterns could be purchased for 10,000won and promised good luck for the year. 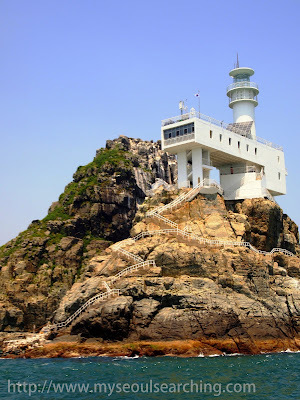 The next day, we were off to Haeundae, arguably Busan's most famous beach, and opted to take a cruise around the coastline from Mipo Ferry Terminal. For 18,000won ($15) a person, it was a great deal, as we were able to see many natural and man-made landmarks in a short amount of time all the while relaxing in the cool coastal breeze. Afterward, we had lunch and cold beer at Gecko's, a western restaurant and pub on the beach that's quite popular among expats. Gecko's also serves up frozen cocktails, allowing its western patrons to feel more at home as far as beach culture goes. Later, we walked along the remainder of Haeundae Beach. Seeing as it wasn't peak season yet, we were still able to see the sand, which I've heard is an impossible feat during the summer months, due to the canopy of tourists and umbrellas cemented on top of it. In fact, locals were preparing for the Haeundae Sand Festival, which was held the following week. Artists were creating spectacular sand sculptures, and we were able to see a few of them still in progress. A light house off the coast of Busan that we saw on our cruise. 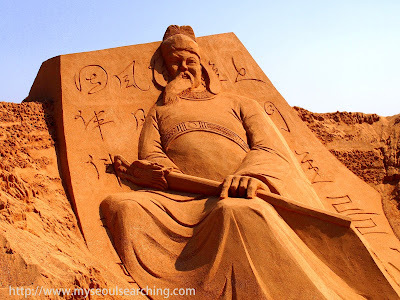 Although most of them were incomplete, the sand sculptures on Haeundae were a sight to be seen. 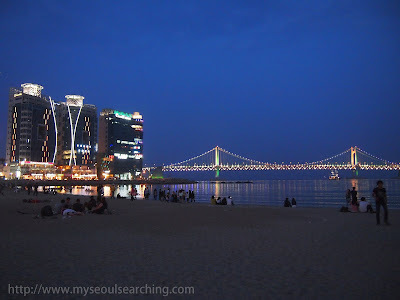 After a few rounds of margaritas, night began to settle on Busan, and we meandered over to Gwangalli Beach, a short taxi ride away. As soon as we arrived, the neon of the surrounding buildings around us lit up, as did the famous Gwangalli Bridge. Young couples and families sprawled out on mats, while others splashed around the shoreline in life jackets. Musicians strummed on their guitars and music sounded from nearby noraebangs (karaoke rooms). It was quite a splendid sight. Many of the restaurants nearby served up fresh fish and other delicacies of the sea, but we had something else in mind. 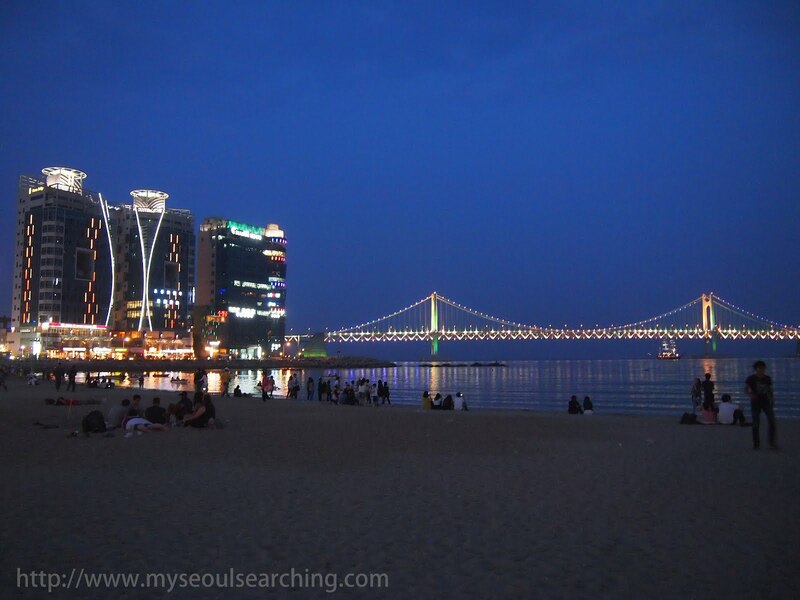 It's easy to see why Gwangalli Beach is the coolest nighttime hangout of Busan. When learning that I would be going to Busan, all of my Korean friends demanded that I try the street food. 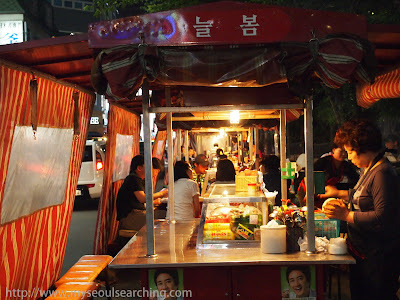 We were excited to see alleys of pojangmachas (street food tents) lining the streets near our hotel, located just behind the Lotte Hotel and Lotte Department Store. We took a seat and were served heaping portions of tteokbokki (spicy rice cakes) and odeng (fish cakes). Surprisingly, street food in Busan puts the street food in Seoul to shame. Not only does it taste better, but the food is twice or thrice the size of the stuff in Seoul!! The hoddeok (sweet sugar filled pancakes) was our favorite, and we especially liked how they covered the pancakes with seeds and nuts, which seems to be a specialty of Busan. The fiery, grim faced vendors often sounded like they were shouting obscenities at us but when I started listening more closely, I realized that they were really just raving about the deliciousness of their cuisine. That's Busan folk for ya. 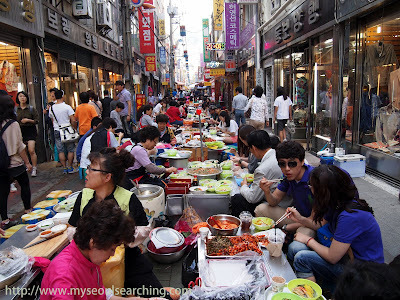 This street food alley near Gukje Market was packed with hungry people. Street food vendors outside Lotte Department store served up the best tteokbokki and hodduck I've had in Korea. We slept in on our last day, drained from all the walking and sightseeing. We checked out the overpriced items at Lotte Department Store before heading to Busan Station. The station area was a bit shady, as train stations around the world often are, but we were still able to enjoy a few more views of the water over ice cream at the station's Lotteria before hopping the train. Heading back, I wondered why it had taken me three years to get down to Busan, as it is no doubt one of the most laid back and relaxing places I've been to in Korea. Still, it was great to have my mom there to experience it all with me for the first time. Soon enough, we were back in Seoul, feeling refreshed in a way that only the sand of a beach and the saltiness of ocean air can evoke. See you again very soon, Busan.